Ok, so I am super new to this whole vegetable gardening thing and it's painfully obvious. I was very excited when we finished our new garden boxes mid April. The husband unit built them and I hauled all of the dirt, about 26 wheel-barrel loads, down our rickety stone steps to the garden area. Nice and Full! Now for a soak in the tub! 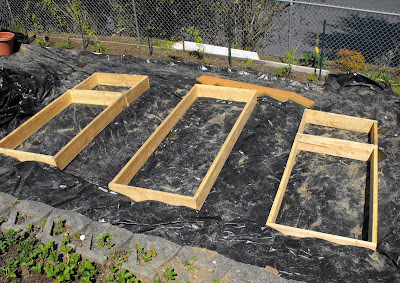 Then the last weekend of April, I sowed seeds directly in the ground, just the ones that can handle the cold as it had been dipping into the high 30's at night through most of April and into early May. Three varieties of lettuce, spinach, green onions, radishes and snow peas. Such glee! 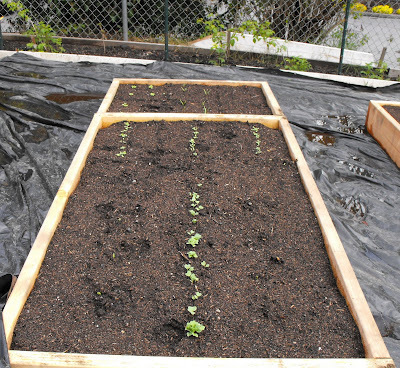 Radishes, spinach and lettuce coming up! This fine Saturday morning, I head out early in the morning to check on my little leafy dears and behold! They've been nibbled! Eeegads! What is eating my lettuce? How can this be? 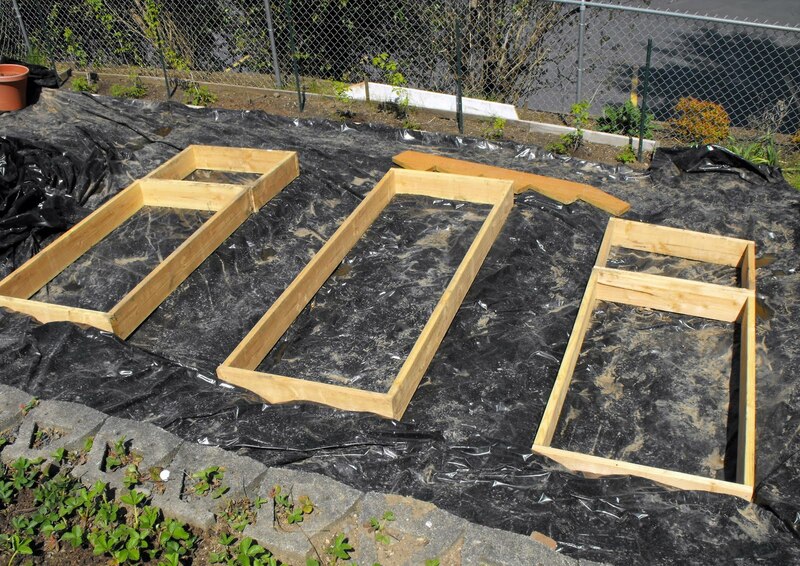 I laid down tarp to keep the slugs out, nor was there any sign of slug trail. So, I was at a loss. And then I hear chirping. Oh, lot's of chirping coming from the back hedge. Could the birds do this? Or would the cat eat lettuce? I'm still at a loss but procured netting today and covered up the starts and hope that they might recover. Someday I'm going to have a drama free vegetable garden. Hey Jenni, keep up the good work- it'll all work out! 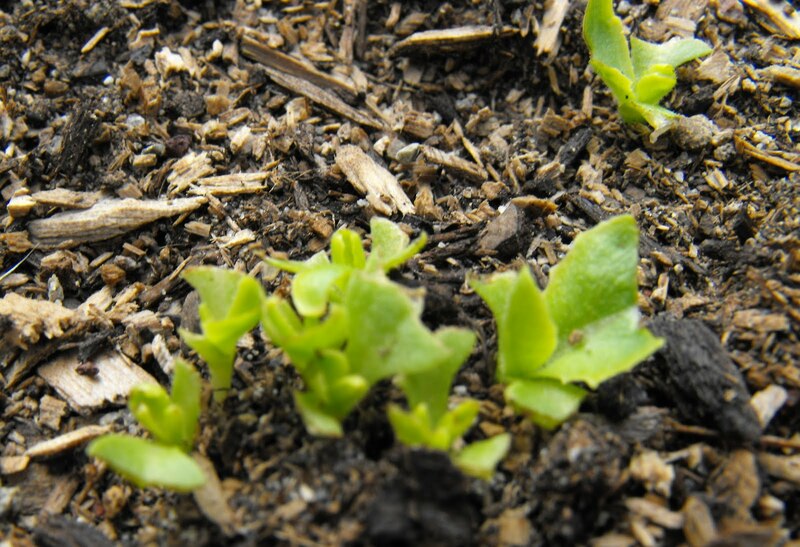 I like to start my seeds inside and give them some good growth before setting them out- that way they have a better chance of survival including being ahead of the weeds :). I use soil blocks and also 200 cell plug flats- very easy to use. Soil blocks are nice because you don't use pots, and there is no root disturbance when transplanting- very nice! Welcome to the world of gardening..there is always a drama and you have to keep just one step ahead of Mother Nature and her minions. Hi Tessa, when you lived on the west side of the cascades, did you start your lettuce indoors too? Good suggestion on the soil blocks! Hazel, thanks so much for stopping by, you're right, there is always drama..a girl can hope right? Hi Cathy, thanks for visiting, it's a joy to learn to garden, but sometimes I wish I had more experience already. I hope the seedlings will resprout. Many of the seedlings here are growing at a painfully slow speed with the cool weather. Now I'm finding that the squirrels are digging all around the vegetable beds and uprooting barely sprouted beans. Like you I'm new to vegetable gardens too and this will be a big learning curve this year. It could very well be birds Jenni. Try popping some netting or chicken wire over the plants until they get bigger. By the way thanks for visiting and commenting on my blog - I'll be back to see how you are getting along. Jenni, I can't offer any help, other than to say that soon you will have so much greenery in that veggie bed, that maybe the odd breakfasting birdie won't do much harm? There I go thinking positively again. Covering them with netting seems like a great idea. Thanks for your comment on my blog. I'm glad to know the mini irises are easy. 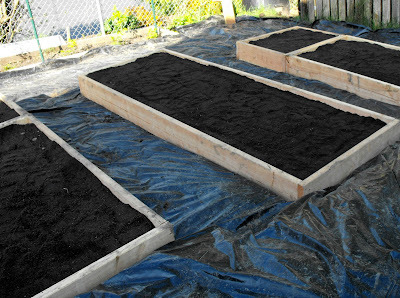 The garden boxes look terrific. The birds probably had a lovely feast. Good luck with the netting. Oh too bad someone had a feast and it looks like you worked so hard! Are you thinking of netting it maybe? Hi Jenni. Sorry I deleted my second last post (you had left a lovely comment on it). I added the same pictures to today's post (I must have been really tired at six am and forgot about yesterday's post.) So I had two the same. Thanks for leaving the comment, anyway! Looks like a rabbit has been enjoying your lettuce! Thanks for following. I am glad to follow your blog as well!